The difficulties experienced by the coal industry between 1914 and 1925. 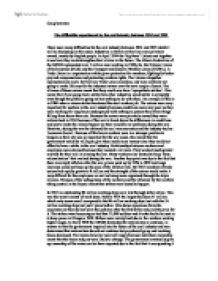 The difficulties experienced by the coal industry between 1914 and 1925 There were many difficulties for the coal industry between 1914 and 1925 which I will be discussing in this essay. Industries in Britain at this time were privately owned, mostly by English people. In April 1914 the 'big three' Unions met together to see how they could strengthen their claims in the future. The Miners Federation of the MFGB represented over 1 million men working in 2500 pits, the National Union of Railwaymen (NUR) and the Transport and General Workers Union (TGWU). A Trade Union is a organisation which gives protection for members, fighting for better pay and compensations and protecting workers rights. The Unions altogether represented one and a half million Trade Union members, and were certainly not going to make life easy for the industry owners over the next couple of years. The alliance of these unions meant that they could now have 'sympathetic strikes'. This meant that if one group had a strike then other industries would strike in sympathy even though the problem going on has nothing to do with them. ...read more. Another key point was due to the fact that there was rapid inflation after the war, prices went up by 25% in 1919 and wage increases could not keep up the pace of the inflation rate. By 1921 members of trade unions had rapidly grown to 8 million and the strength of the unions would make it very difficult for the employers as well as being more organised through the triple alliance. Because of the unhappiness of the workers and the influence by the workers taking control in the Russia meant that strikes were bound to happen. In 1921 an outstanding 86 million working days were lost through strike action. This was the worst amount of work done. Before 1914 the largest had been 41 million which only seems small compared to the 86 million working days lost with the 35 million working days lost just 2 years before. This shows ignorance from the employers as they did not solve the problem after the first strike and paid the price for it. The strikes were becoming so bad that 12,000 soldiers and 6 tanks had to be sent in to keep peace in Glasgow 1919. ...read more. However, even with these bad terms the coal industry were no longer making a profit and were losing about a million a month. Many miners were also now unemployed because the owners could not afford to pay them. The owners could no longer run the mines the way that they were going so they made a further wage reduction and increased the hours. The MFGB wouldn't accept these terms either and the Triple Alliance was re-joined once again. Something had to be done as there was a clear lack of communication between the employers and the workers. Stanley Baldwin then offered the MFGB 24 million to counter the owners wage cuts until 1st may 1926. However this was only a short-term solution because it would only postpone the problem for the nine months. However the government used this time to try and find a way to solve a general strike if there was one when the subsidy ended. They held weekend courses to train ordinary people to drive railway trains and vehicles. They arranged to take over the BBC to publish a government news sheet and used propaganda to stress the threat to parliamentary democracy from the general strike. Craig bowman ...read more. 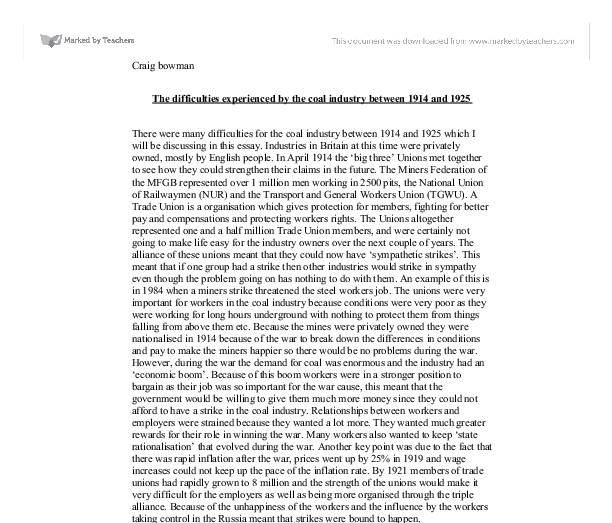 This student written piece of work is one of many that can be found in our AS and A Level Trade Unions section. Why did the General Strike of 1926 take place? People joined the OMS for a number of reasons. The middle class thought the strike was a threat to them and an attempt to ruin the country economically. Others joined for financial reasons, the Government paid constables �2.31 a week plus food. The miners were on strike refusing to accept wages of �1.58. 'A shift-share analysis of disaggregated industrial composition of employment and union membership between 1980-6 carried out by Freeman and Pelletier (1990) confirms that industry composition has had no significant effect on union density in the 1980s' (Disney & Someone YEAR DATE). The Canadians took an example from the Russian's Bolshevik revolution that occurred in 1917, where the Russians were able to overthrow their government and opt for change. Canadians however did not want to resort to violent acts like the Russians, but they believed that they can bring change if the working class had more power. Does this suggest that the strike is no longer necessary? It can be argued that the decline in strike activity is a direct result of the contraction of basic major manufacturing industries, such as coal-mining, the docks and motor vehicles. What is the influence of women social workers in the United States labor movement? The decline in the union density ratio has been much smaller for women than for men. There is a traditional belief that women are more difficult to organize than men, despite early unionisation of some occupations that were largely female clothing workers and telephone operators, for example.